At some point in your developer career, you will come across a situation where you would like to share code between two or more apps. It could be some utility methods or a super cool annotation-based database library and you might even want to share it with the community by open sourcing this piece of well crafted code. When we have some common code to share between apps, the way to do it is to build a Java library (.jar file) if it has nothing to do with Android or as an Android library if it does (.aar file). That way, our code is written once and can be reused easily. To share our code as a library we have two different ways. 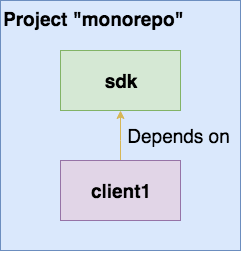 compile project(':sdk') // local dependency to the module named "sdk"
The biggest advantage here is that you can very quickly make a change on sdk and run immediately client1. You can see those two modules side by side under the same project, and all its code is right in front of you. This could be good enough for a while but to get more flexibility in your day to day workflow the next step is to have multiple projects. You should know there’s an option to use git submodules (or svn externals) to share modules between projects at the VCS level. This is a valid solution but it is not as comfortable as having multiple projects. I find this solution quite inconvenient especially when you use branching very often. 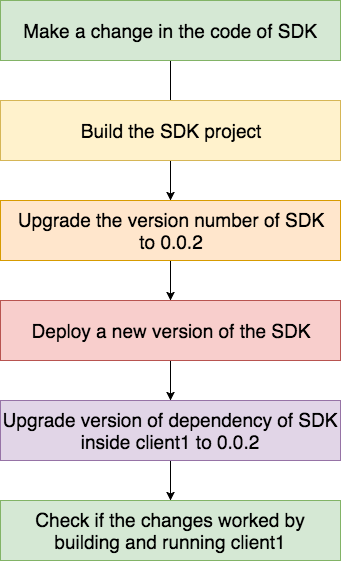 The client1 project needs to get the built sdk library from somewhere. This somewhere is called a Maven repository and it can be on your local machine, on a distant one like jCenter or a Mvn Repository or a private Artifactory behind a VPN. 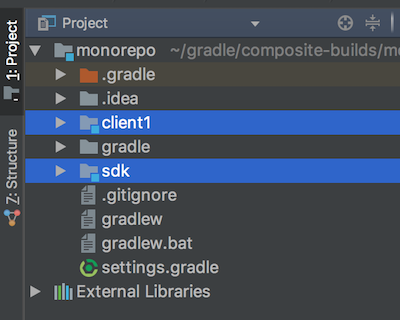 To learn about how we to deploy a library to a Maven Repository, check this Gradle Publish Plugin. Proper control versioning: Having separate projects means you get a complete overview of the commits per project. It is easier to see what was changed and it is so much easier to work with branching when needed. Proper library versioning: When working on client1 and upgrading the sdk to a new version by adding a new feature, we will have to deploy a new version to our Maven Repository. This means we are not obligated to upgrade right now any other project so we can better focus on our current task. To resolve this issue we usually build a testapp. We’ll add a module called testapp in our sdk project so we can run our library in a client built just for the sake of running the sdk. It’s a nice solution, as if we had to develop an new UI component on Android, we could add it in a screen multiple times in different sizes to check that it behaves correctly. This way of testing our sdk was the best we had for a long time, but now we have a better solution! Composite Builds is a new feature (added in Gradle since version 3.5) which allows us to override an external dependency with a local one, depending on OUR terms. Sweet! Let’s see how it works. We make the assumption that the two projects (comp-client and comp-sdk) sit side by side in our file system. We test if comp-sdk is actually there besides comp-client for real, and if so, include that project as a module. And that’s it! Every change we make in comp-sdk will be compiled and used in comp-client like if those two are regular submodules! This is BIG. It means we get all advantages of both submodules and multi-projects worlds, together! Thanks to the if-condition, if one of our colleagues still prefers the multi-projects setting she/he is free to continue to do so by simply not having comp-sdk be side by side in her/his file system. The only remaining issue is to not forget to still release a new version of comp-sdk at the end of the day for the people or CI servers who will not use this feature. A nice git-hook could be used to automate the inconvenient workflow of upgrading/deploying/consuming a new version but that’s worth its own blogpost. Both submodules and multi-projects have pros and cons. Composite Builds are the perfect middle ground. Composite Builds give us the advantages of submodules by having all the code under the same project easily modifiable and quickly runnable. We also get the advantages of multi-projects of versioning and isolation without the perpetual context switching between projects and releasing a version for every small change. Give it a try and comment here to tell me what you think about it!